Syria's Christian community is one of the oldest in the world, going back two millennia. The castle is now badly damaged, bombed by government jets after it was used as a base by rebels in Syria's civil war. Nor has that war spared the Christian community. 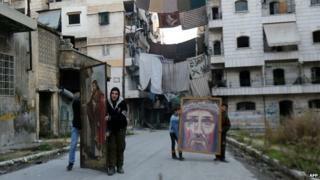 Thousands have been forced from their homes by the threat from hardline Islamist rebels and jihadist militants. In areas seized by the jihadist group Islamic State (IS), Christians have been ordered to convert to Islam, pay jizya (a religious levy), or face death. In the Syrian province of Hassakeh in February 2015, hundreds of Christians are feared to have been kidnapped by the militants. Senior Christian clerics have also been kidnapped by unknown gunmen. Suspicion for the abductions has fallen on the Nusra Front, al-Qaeda's Syrian affiliate. While their community faces a clear threat from the extremists of the Nusra Front and Islamic State, Christian men have been fighting in the multi-layered conflict - either alongside Kurdish militias or alongside relatively secular rebel factions, or government forces. Christians are believed to have constituted about 30% of the Syrian population as recently as the 1920s. Today, they make up about 10% of Syria's 22 million people. The vast majority of Syrian Christians belong to Eastern denominations. The largest and oldest is the Greek Orthodox Church, which has about 503,000 members. The Armenian Apostolic Church has between 112,000 and 160,000, and the Syriac Orthodox Church about 89,000. Despite their minority status, Christians have long been among Syria's elite. They have been represented in many of the political groups which have vied for control of the country, including the secular Arab nationalist and socialist movements which eventually came to the fore. A large proportion of the country's Sunnis also tolerated or supported the Assads, whom they saw as guarantors of stability. Hundreds of thousands of Christians have been displaced by fighting or left the country. Melkite Greek Catholic Patriarch Gregorios III Laham said last year that more than 1,000 Christians had been killed, entire villages cleared, and dozens of churches and Christian centres damaged or destroyed. Some communities are reported to have taken up offers from the government to arm groups of youths, called "popular committees", to defend themselves from rebel attacks. Christian opposition activists have accused the government of stoking sectarian tensions, including by using Alawite-led security forces and Alawite militiamen to target Sunni civilians, and overplaying the threat posed by the rebels to Syria's minorities. "There is no persecution of Christians and there is no single plan to kill Christians. Everyone respects Christians," he insisted. "Bullets are random and not targeting the Christians because they are Christians." But on 15 April, Patriarch Gregorios had warned in a statement sent to a Catholic charity: "There is no safe place left in Syria." "The future of Christians in Syria is threatened not by Muslims but by... chaos... and the infiltration of uncontrollable fanatical, fundamentalist groups," he said. Patriarch Gregorios said the threat to Christianity in Syria had wider implications for the religion's future in the Middle East because the country had for decades provided a refuge for Christians from neighbouring Lebanon, Iraq and elsewhere.